I've been gluten free for about 10 months now, and am feeling much, much better than I was before. After getting over the initial shot of trying to actually eat gluten free, I've been on a learning adventure of sorts--trying to learn what I can and cannot eat. In the early stages, I was desperate to find some pre-mixes that would help with the transition. 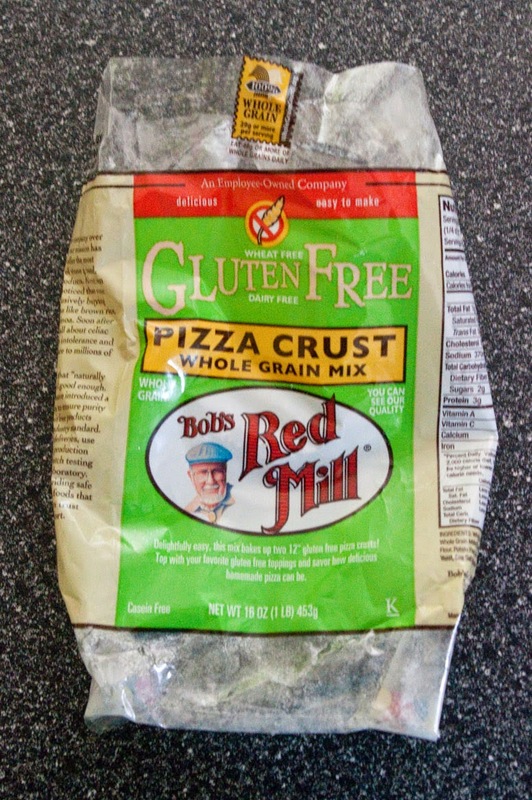 I've tried a number of brands, but the one I keep coming back to are the Bob's Red Mill Gluten Free mixes. I have tried their brownie, cornbread, pizza crust, and all-purpose baking flour. All of these are excellent!! I think it's safe to say that at this point, they are my favorite among the pre-mixes. Granted, these kinds of mixes probably shouldn't be used a ton, simply because like most other pre-mixes, they're high in calories. But, I have to say that they are good! I tried a new recipe today with one of these mixes, and I'm going to let you know how it turned out. But, stay tuned at the end and I'll tell you where you can get these mixes for a lot less than at the regular grocery store. 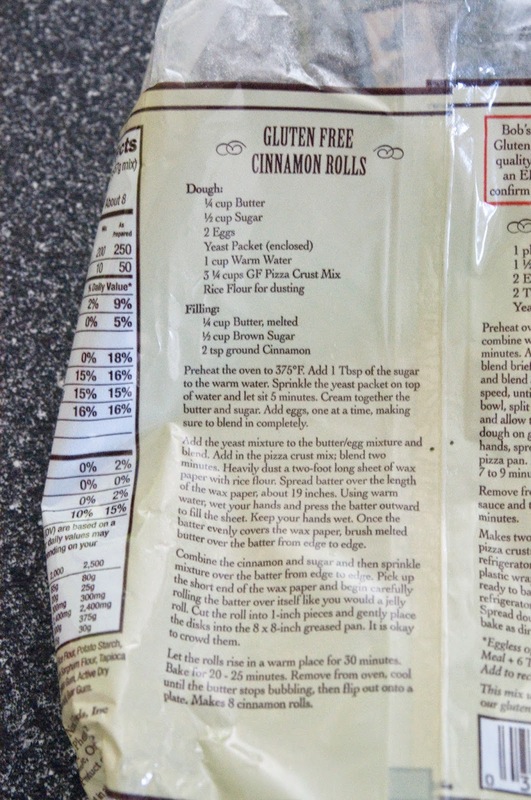 I noticed a while back that the pizza crust mix package has a recipe for gluten free cinnamon rolls. My hubs actually noticed it and said he definitely wanted to try it. Today, I had some free time, so I thought I'd give it a go! It's been more than 10 months since I've tasted a cinnamon roll. The instructions are pretty easy to follow. 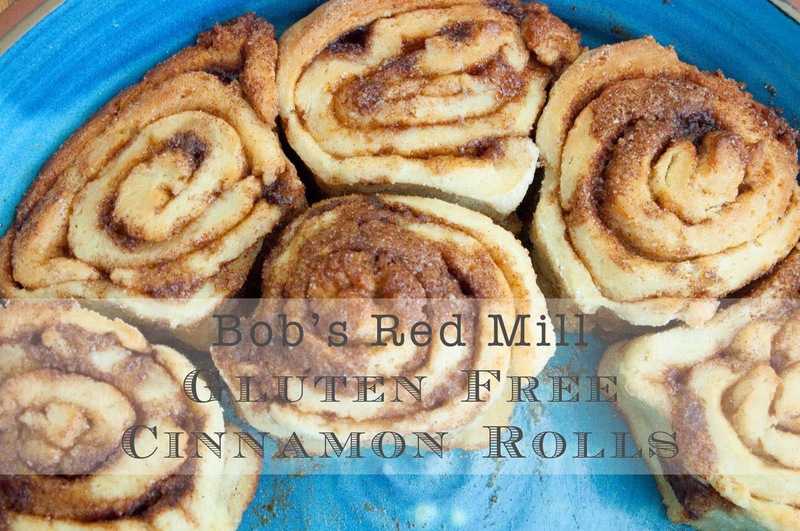 I may use a bit less butter next time, since I used the recommended amount, and as I rolled the cinnamon rolls up to cut them, the yummy cinnamon/butter/sugar mixture started running off the wax paper as it was getting squished out. So, maybe do just a tad bit less butter next time. Oh, and I should also tell you that it calls for 3-1/4 cups of the pizza crust mix. That is equal to 1 package, plus 1/4 from another package, so buy 2. Use the rest of the other package for a pizza crust! And here they are, all nestled in my spoon bread pottery dish (that I love), and setting out to rise for 30 minutes. 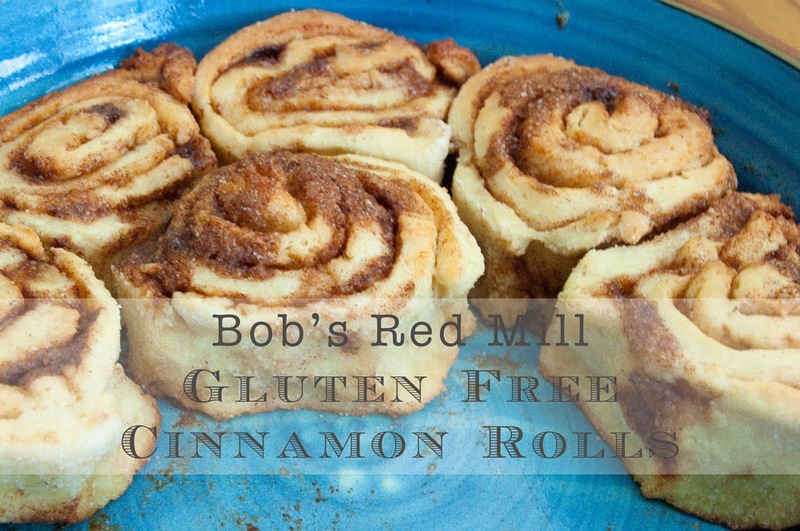 My hubs (who isn't necessarily gluten free) thinks they'd be even better with some icing (and I'm sure he's right), but I enjoy them even without it. He did even say that you wouldn't know that they're gluten free. 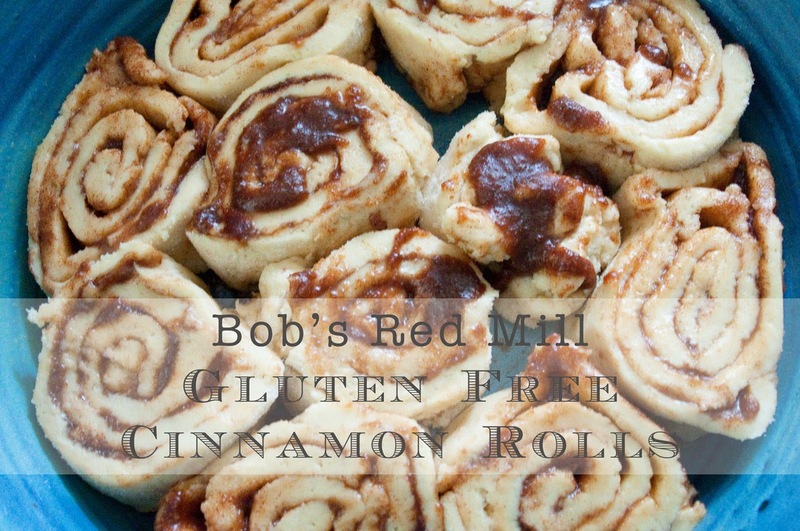 Now, I promised to tell you how you can get these fabulous Bob's Red Mill mixes for a lot less than you would pay at your normal grocery story. Are you ready? Here it is--head to Big Lots!!! They have a really great selection that they carry on a normal basis! I can get flax seed, flax seed meal, quinoa, and so many other gluten free/friendly things there too! So, if you were tempted to turn up your nose at the ol' Big Lots, think again. 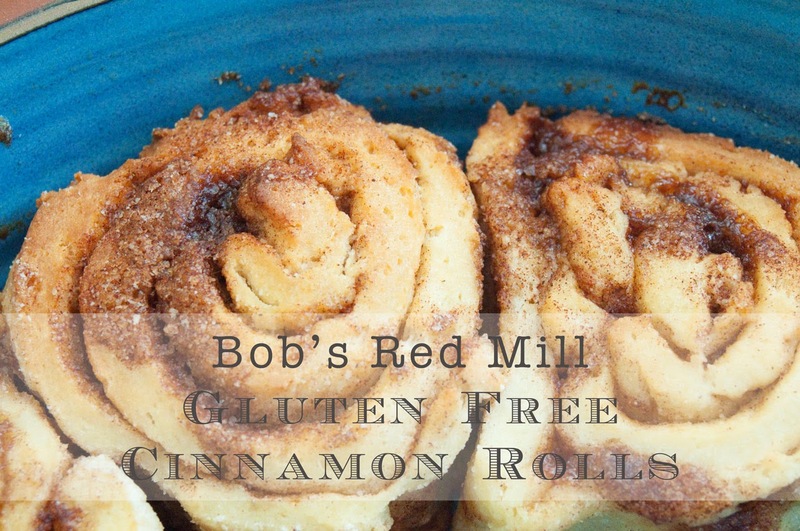 They regularly stock Bob's Red Mill gluten free products, and most of them are at least $1.50 less than the grocery store, if not much more! And if you're part of their rewards club, they'll periodically send you $5 off coupons. Yay! I love when I can save money, AND be gluten free. Disclaimer: Sometimes my posts can contain affiliate links, but this is not one of them. No one has asked me to do this review, or paid me to do it. This is my opinion--100%--and no one else's. 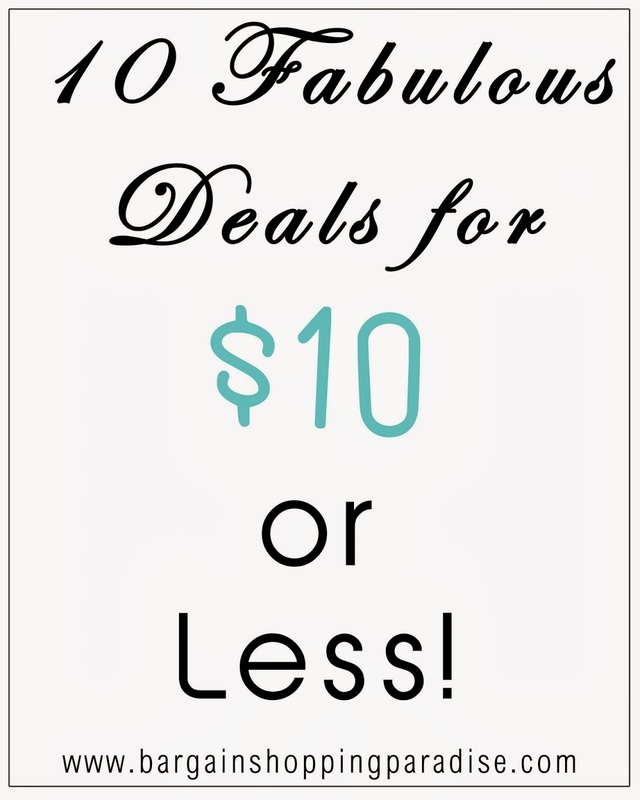 10 Fabulous Deals for $10 or Less! 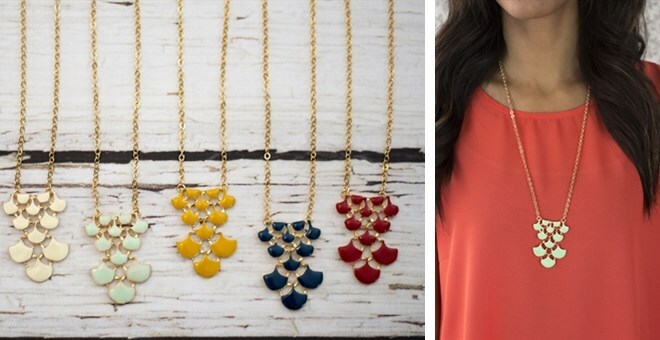 My inbox quickly fills up with daily boutique deals these days. I just love them! I don't buy everything I see, but the e-mails themselves are filled with so many pretty things that I just love looking through them. Very often, I will encounter some AMAZING deals just by perusing these e-mails. And I've been wanting to share some of my own favorite deals with you all with a bit more regularity. 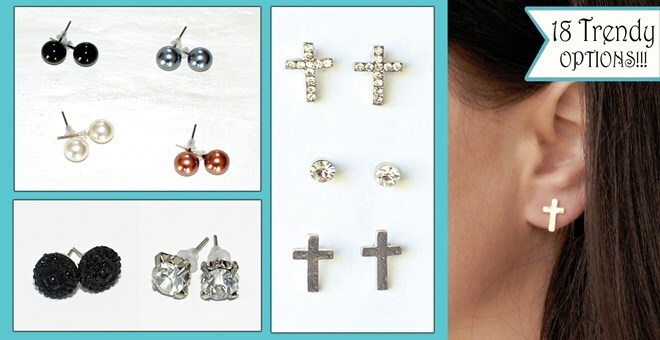 Something about these deals scratches a deep bargain shopping itch! 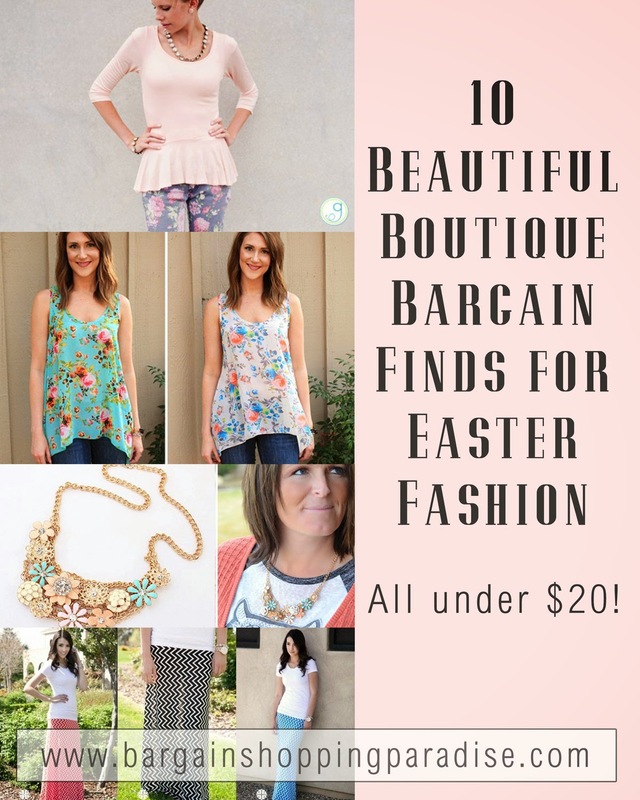 So, here's my first installment of favorite deals for $10 or less! Click on the images, and enjoy! $6.99 | SEAMLESS RACERBACK WORKOUT TANKS – 8 COLORS! 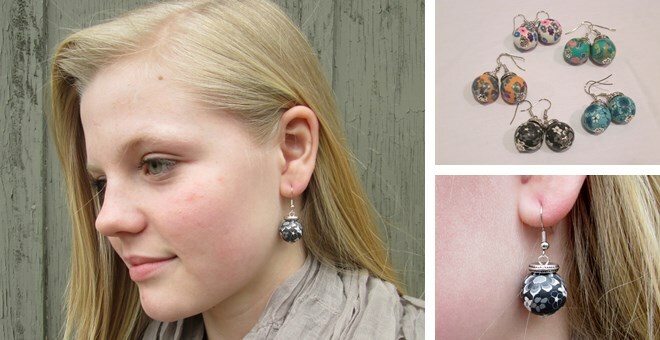 $4.99 | ASIAN STYLE HANDMADE BEAD EARRINGS IN 5 COLORS! *Disclaimer - some (but not all) of these could contain affiliate links. I've been wanting to do another cork board project for a while, since I did my DIY jewelry organizer cork board. Cork boards are such an easy, fun thing to revamp. It's kind of addicting! 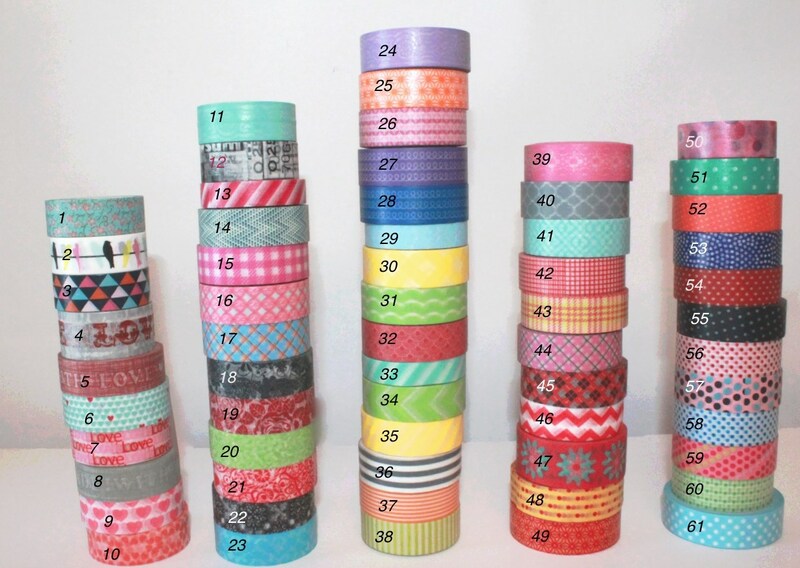 I see people doing them all the time on Pinterest, too. 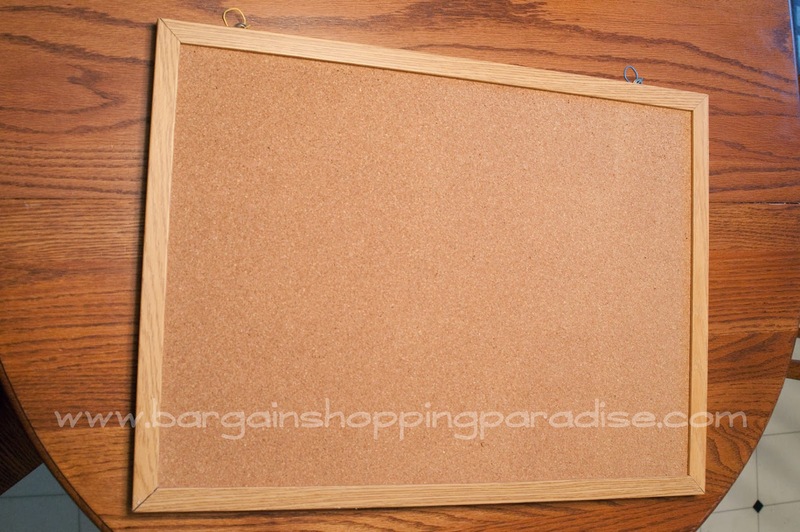 I recently picked up a cork board in good condition from a local thrift store for $1.99--so cheap!! 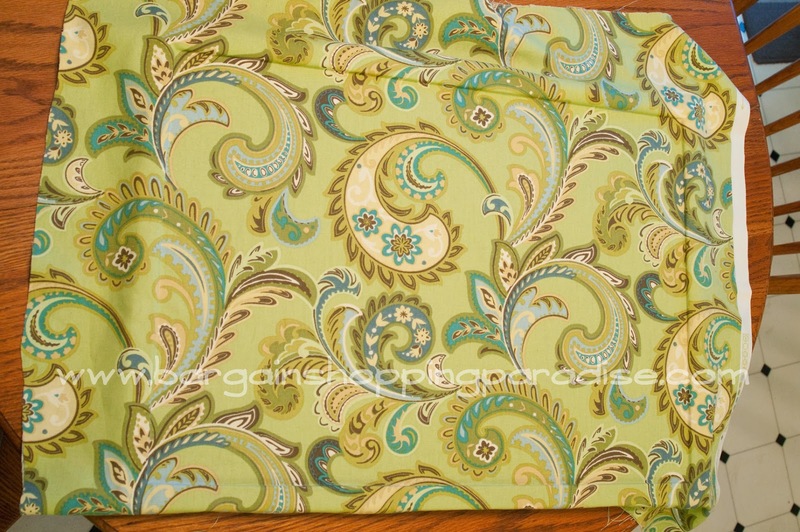 I also had a remnant of fabric that I love, from my DIY ottoman recover project, way back when. That ottoman now sits at the foot of our bed...accumulating lots and lots of clothes. 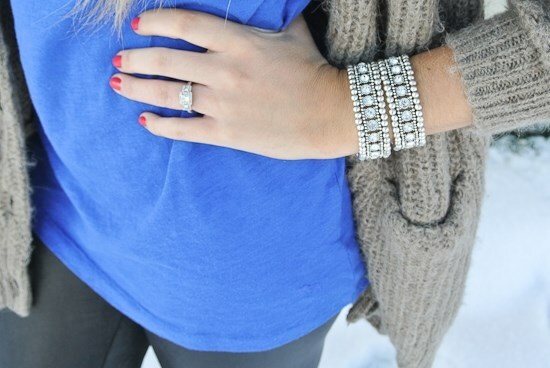 My hubby loves that. Anyway, I've been wanting a command center-type cork board for our kitchen. So, once I had that cork board, I knew exactly which piece of fabric I wanted to cover it with. 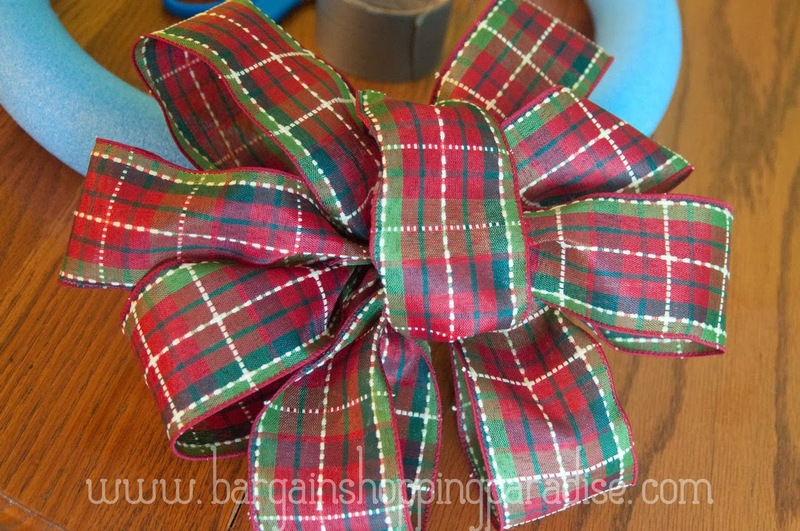 Fabric - Make sure your fabric is durable. 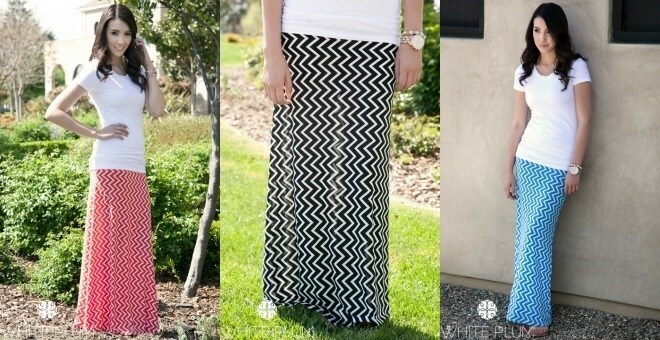 Perhaps use an outdoor fabric, or even burlap would be fun. 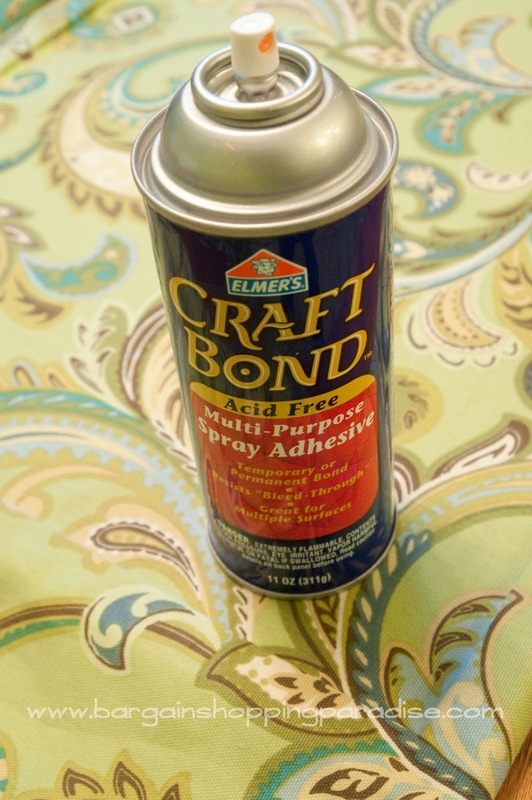 Adhesive - I use Elmer's Acid-free Craft Bond spray. It's quick and easy. 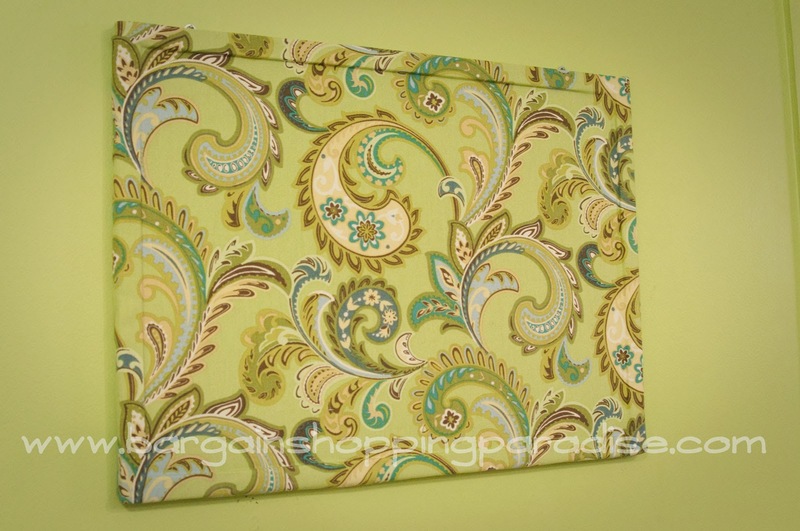 Lay out your cork board and figure out how you want your fabric to lay. Spray your adhesive all over the parts where you want your fabric to stick--I mainly wanted to adhere my fabric to the cork part, and inside edges of the frame. Quickly begin to smooth your fabric over the cork board. Use your straight edge to help smooth it out, but be gentle. Some people make be more effective at just using their hands. I used both. I also made sure I pressed the fabric into the crease where the frame meets the cork, because I wanted to keep the frame-look. After the adhesive has started drying, and is really stuck to the cork board, begin wrapping the fabric around the edge of the frame. If you're wondering about corners, just wrap them like a present. 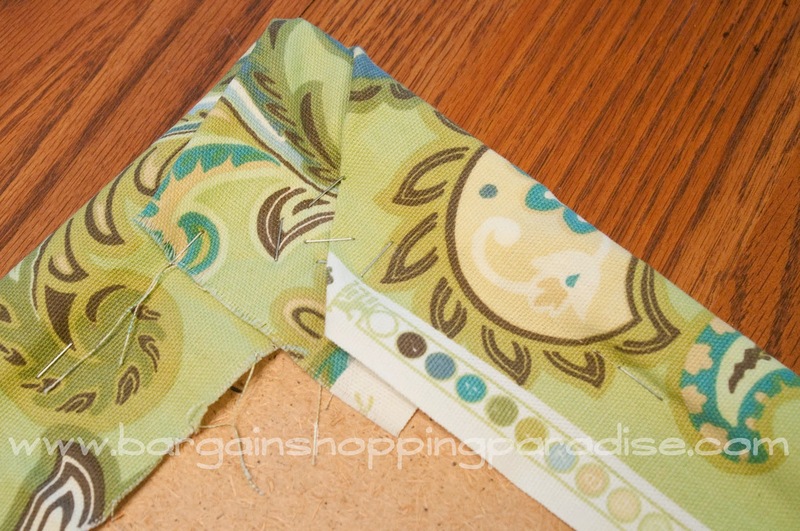 Use your stapler to fasten the fabric to the backside of the board. Pull the fabric taught, but not too tight. You don't want it to pull up from the adhesive surface. Hang your cork board and enjoy! This project literally cost me only $1.99 (for the cork board). That's it! I had everything else on-hand! YAY!! And I'm really enjoying it. 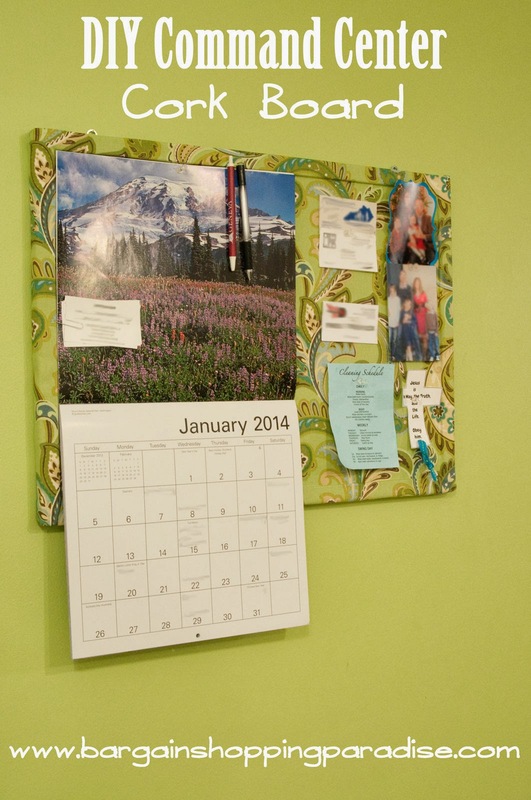 It looks perfect in our kitchen, and is the perfect place for our calendar and other items that help us stay organized, and on the same page. DIY Pool Noodle Christmas Wreath - under $3 total! Merry Christmas to you all! 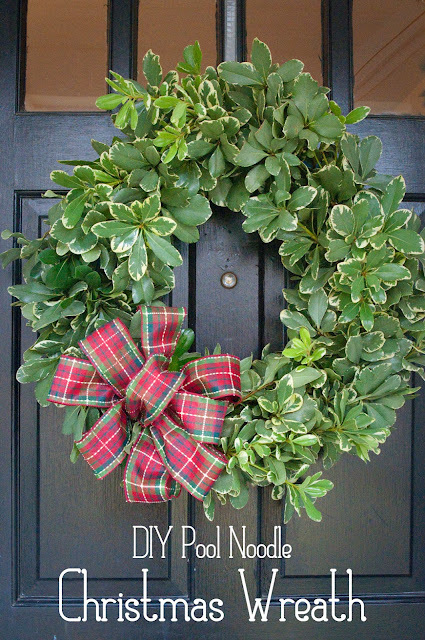 I hope you're enjoying the holidays, wherever you are and whoever you're with. I've had a dream now for quite some time. 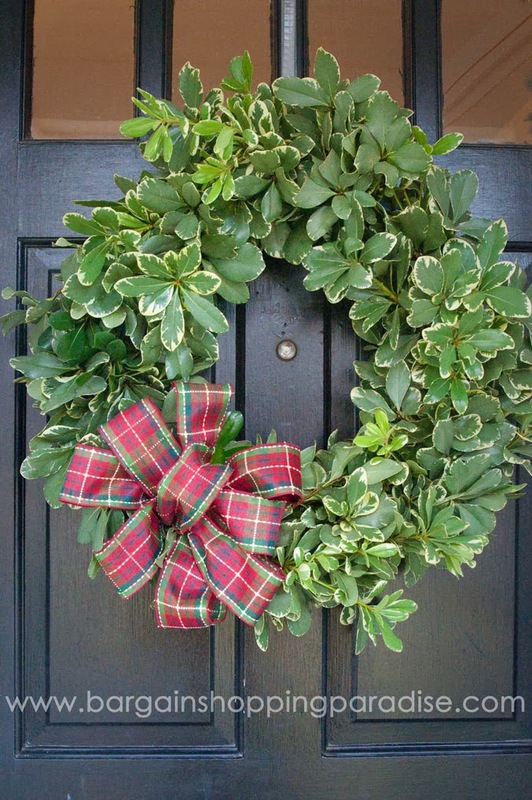 I've dreamed a dream of a big, beautiful Christmas wreath for my front door. And I've dreamed of paying next to nothing for it! Surprised? 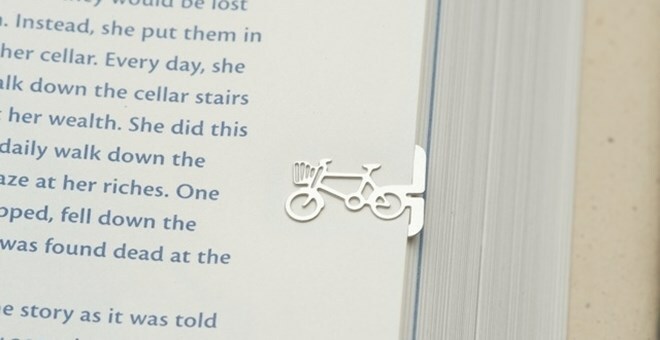 But, alas, I just wasn't finding one, and I didn't have enough creative spark to see what was around me. 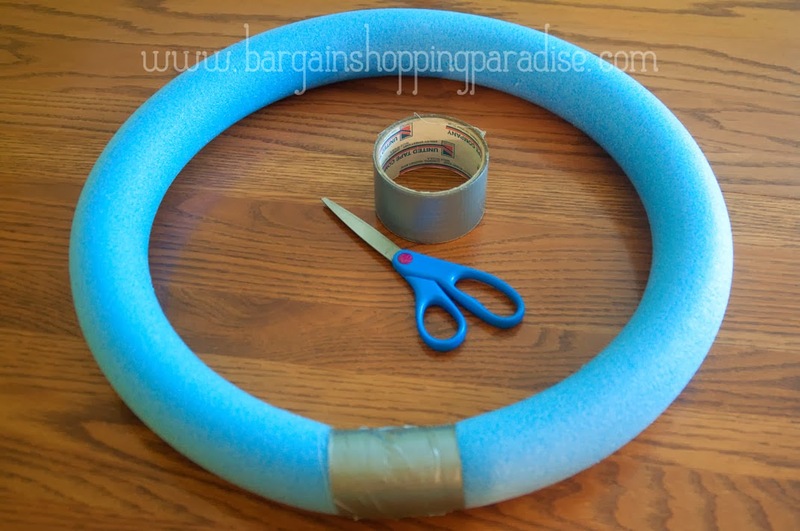 One day, I remembered seeing something on Pinterest--someone had taken an old foam pool noodle and shaped it into a wreath form. I had just one such pool noodle! We've actually had this blue one that has been more used as a sword than anything else, but it was starting to get beat up. So I confiscated it. You may think me selfish, but seriously...they had three other "real" swords to play with. 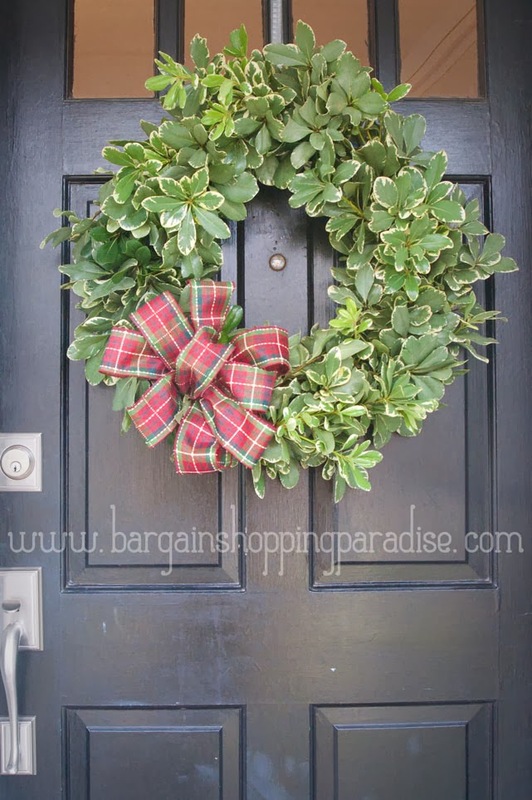 I was also recently walking through the garden center at my local Home Depot, drooling over all the natural wreaths they were selling--white pine, firs, boxwoods--and they were all so pretty. But I stopped and looked at the boxwood wreaths, thinking they were so pretty, and how I wished I'd taken advantage of some of the boxwoods at my old house to make one of these wreaths. Hey! Wait a second! I have these Variegated Pittosporum bushes in the front of my house that would make a beautiful wreath!! It was all coming together. 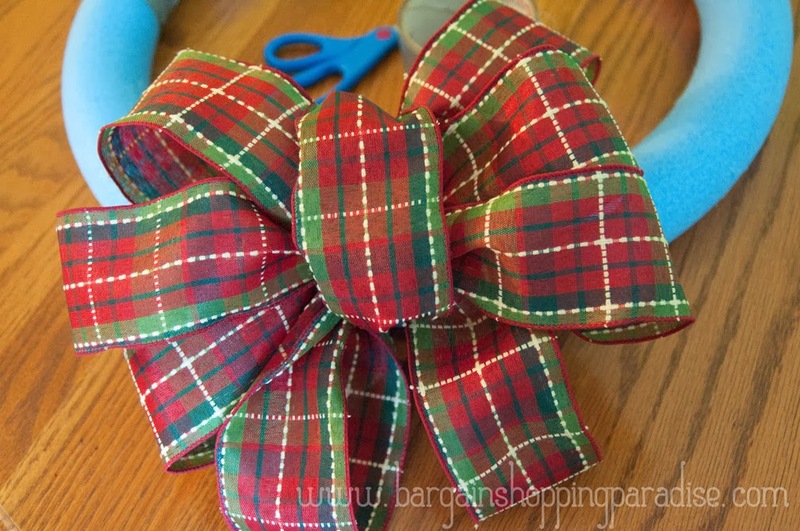 I just needed a bow! Enter Big Lots. I made a quick trip up there, found exactly what I was looking for (I paid LESS than $3 for the wire ribbon), looked up a bow-making tutorial, made my bow, took clippings from my Pittosporum bushes, made my pool noodle wreath form, and well...you'll see. So, I'll try and walk you through everything I did. It was so fun! And it was even more fun to see the end result! First you can either Google pool noodle wreath form, or search for it on Pinterest. Then you can also Google (or search on Pinterest for) DIY wreath bows. Find one that you like that sounds doable, and there you go. There are lots of good tutorials for these two things, so just go with one that you like. MAKING THE WREATH FORM: I took the pool noodle, and fastened the ends together with duct tape...lots of duct tape. 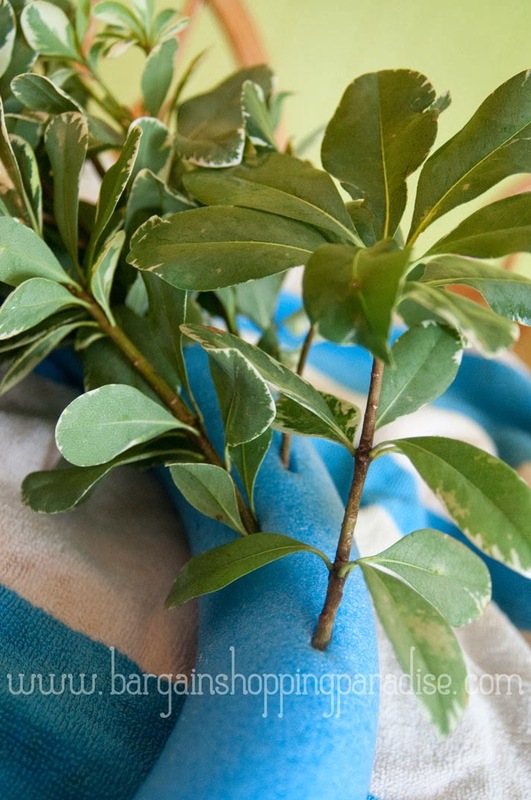 You want to use PLENTY, because you'll be adding the weight of whatever foliage you'll be using. 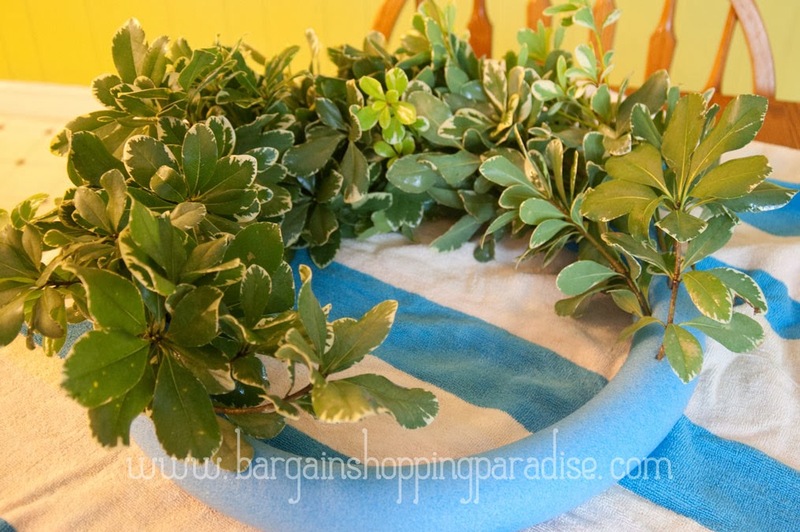 BUILDING YOUR WREATH: Once you've fastened the ends together securely, and you've gathered your foliage clippings, you can start inserting them into the pool noodle form, much like you would into floral foam. TIP: When I was gathering and trimming my Pittosporum clippings, I trimmed them so that the ends formed a sharp angled point, which made them easier to insert into the foam. I also made all of the clippings go the same direction--it was just a personal preferences, but you can make them look however you want. 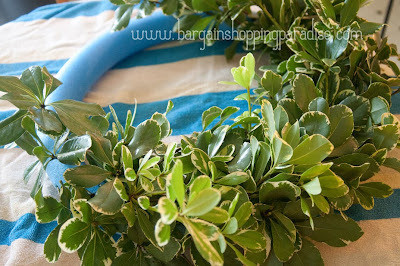 FASTENING THE BOW: After I was done filling up the wreath with the Pittosporum clippings, I used a paperclip to help fasten the bow to the wreath. I just unfolded the paperclip, bending the wire into a u-shape which I inserted into the base of the bow, and then poked into the foam noodle. I'm sure there are other ways, but that's how I did it, and it worked well.